Did you know that this Tuesday is Shrove Tuesday, a.k.a. Pancake Day? Thought I’d post this tonight in case anyone is interested in celebrating with me! To be honest, most Tuesdays are Pancake Day in this apartment. As anyone else in the food business will understand, the work schedule can be a bit weird. My days off are right smack in the middle of a “normal” workweek. I don’t mind so much…while everyone else is off to the grind, I get a luxurious sleep-in, and exactly what I want for breakfast. This recipe for Oatmeal-Raspberry Pancakes comes from Sunset Magazine, but I actually saw these beauties first on Joy the Baker last year. As soon as I saw Joy’s post, I thought, “That’s brilliant!” Pancakes and oatmeal are my two favorite breakfast foods…I most often enjoy them separately, but a combination sounded positively intriguing. You might think oatmeal would make the cakes heavy and gunky, but they’re actually fluffy and high. I’ve made these a few times now…half a recipe gives two generous portions. If you’re tired of the maple syrup thing, serve these with a berry coulis instead. I never tire of the maple syrup thing, and here I gently heated my syrup and tossed in a handful of frozen raspberries, just as I turned off the heat. As the berries thawed in the warm syrup, they gave off their lovely pink color. Want pancakes but don’t feel like these? 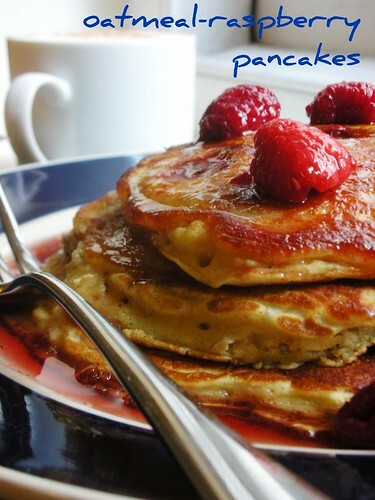 Check out the Bill’s Ricotta Hotcakes I made awhile back! -In a bowl, mix oats and buttermilk. Let stand for 15-30 minutes. -Meanwhile, in a small bowl, mix flour, sugar, baking soda, baking powder and salt. -In a large bowl, beat eggs, milk, and vanilla to blend. Stir in flour and oat mixtures just until evenly moistened, then gently stir in raspberries. Let the batter sit while you prepare your griddle or pan. -Place a griddle or a large nonstick frying pan over medium heat (350°F). When hot, coat lightly with oil or butter and adjust heat to maintain temperature. Pour batter in 1/2-cup portions onto griddle and cook until pancakes are browned on the bottom and edges begin to look dry, about 2 minutes. Turn with a wide spatula and brown other sides, 1 1/2 to 2 minutes longer. Coat pan or griddle with more oil or butter as necessary to cook remaining pancakes. -Serve the pancakes as cooked, or keep them warm in a single layer on baking sheets in a 200°F oven for up to 15 minutes. Stack and serve with berry coulis or syrup. I haven’t tried oat meal ones before! These look great! When I’m feeling lazy I like to stir a pack of instant oatmeal into my pancake batter! Yum, oatmeal pancakes. I love cooking with oatmeal, it’s so versatile and healthy. I considered an oatmeal pancake recipe this morning, but settled for pumpkin ones instead. I guess we know what I’ll be making next Sunday for breakfast! They look delicious and beautiful! Yum! Great post & photos. These are lovely! I don’t usually like oatmeal, but let me tell you, I would *not* pass up these beauties! Those look amazing! I really need to figure out a good pancake recipe, there’s been so many delicious photos popping up everywhere recently! Yummy! This looks sooooo delicious! I love pancakes. incredible! these look totally mouthwatering! I’m all in for pancakes this Tuesday! I really don’t need an occasion, but if you give me one, I’ll take it! Mind if I celebrate with you???? ?Delicious looking pancakes! Oh MY! These pancakes look just perfect for breakfast. Maybe even lunch and dinner too!!! Love Em! Those look perfect! I’m always looking for new pancake recipes to try! Any time you want to celebrate pancakes, I’m there with you! Especially with these oatmeal raspberry one–they look sensational! I love a good pancake–it’s a great delicate food that packs a great punch of flavor, and yours look like they do all that and more! YUM! Delicious!!!! I love the addition of oatmeal too! I have everything to make these pancakes! Looks like I will be celebrating! They look fantastic! Yum–I love raspberries. I’m definitely going to have to try these. Pancakes make for an easy dinner that both my girls will eat without complaint. I just starred this recipe, I think I’ll make them for the kids tomorrow morning! Oatmeal Raspberry pancakes sound amazing. YUM! These look delicious! I love pancakes! Those really do look very good. I don’t have that sweet a tooth (I’m more of a savoury pancake man) so the oatmeal and raspberry is good for me. Savoury recipe on http://www.discoverunearthed.wordpress.com – with prosciutto crudo! I have been messing around and trying to find a really good pancake recipe lately – and this one just made it to the top of my to try list. These sound amazing–I am going to make them this weekend! Thanks! I so wanted pancakes that day! The look wonderful! I have never come across a pancake recipe that looked yummier .. I MUST try this! Thank you so much for your recipe! I’ve never before left a comment about a recipe but I’m on my second pancake at the moment and counting my blessings for having stumbled across your splendid and delicious idea. I used porridge oats, added pinhead oatmeal and topped them off with greek yogurt and honey. They’re a little bit of heaven on earth. I’m sure I’ll manage to squeeze in a third! Blessings! Just made these for my family and everyone loved them!! They are hearty and filling, yet very light and fluffy. Thanks for the wonderful recipe!